Each day a different image is featured on the homepage. Each image highlights research occurring at the Institute. 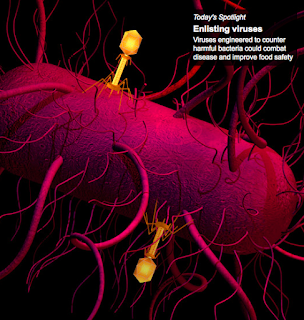 Today, it highlights a virus that can combat bacteria. Each Friday, the university features a student, faculty, staff or alum photo on its home page. Several things occurred to me regarding the effectiveness of website imagery to convey brand distinctiveness. First was the size of the images – full bleed versus very small. In every instance, full bleed images were much more effective. This worked very well for MIT and RISD and terribly for Princeton. Second was the consistency of images. MIT’s images always conveyed the same thing – very interesting leading-edge research. RISD’s images were also fairly consistent in conveying a design aesthetic. Paul Smith’s images conveyed a fairly consistent feeling of outdoor experiential education. Next, the use of a video instead of still images was very effective for Reed College. And students and faculty talking about Reed’s unique educational approach clearly communicated distinctiveness. Finally, changing images such as MIT’s new image every day and University of Rochester’s photo Friday indicated a level of dynamism and, in University of Rochester’s case, community engagement. Don’t underestimate the power of imagery in conveying a certain brand feeling and brand distinctiveness.